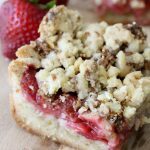 These Gluten-Free Strawberry Crumble Bars from The Whole Smiths are brought to you in partnership with California Strawberries. 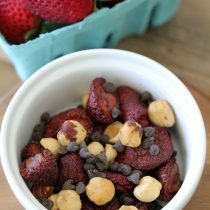 They are a decadent and delicious summer snack that will leave you wanting more. 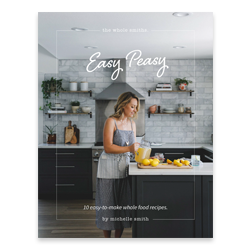 Gluten-free, dairy-free and vegetarian. If you’ve been following The Whole Smiths for any length of time you know we are all about balance. We keep hearing that though, everyone keeps talking about #balance but what exactly does that mean? Well, it’s going to mean something different for everybody. So what balance is to me may be a little different for you. For me it means that I live as healthy of a lifestyle I can, make as many good choices through the day knowing it won’t always be perfect. It also means that when I do have something delicious, like dessert, I’m going to really enjoy it. It’s going to have to be knock-my-socks-off delicious. The more delicious it is, the less I feel bad about indulging in it. For example if I dive into a bag of mediocre gummy bears… eh, so not worth it. I know I didn’t really enjoy it and it just wasn’t worth it. However! 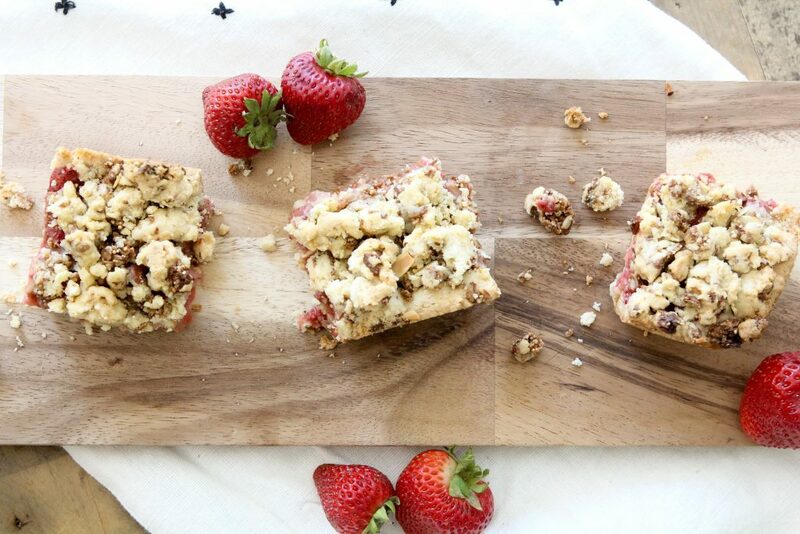 If I have one of these Gluten-Free Strawberry Bars I will savor every bite and feel totally satisfied at the end because it was delicious and worth every bite. Here’s the thing, I think a sweet treat or dessert should still taste like a dessert. I’m not always a fan of paleo-fying every dessert, bar, snack, treat out there. Often times it just doesn’t taste as great as it’s “regular” counterpart and leaves us craving something else. And let’s be honest, coconut sugar is still sugar. It’s not a HEALTH food by any stretch but a slightly better for your substitute. What I did with these Gluten-Free Strawberry Crumble Bars versus a standard bar was remove some of the components that aren’t serving my body (like gluten), left some of the less-than stellar ingredients that were impacting taste (the sugar) and added fresh fruit rather than processed or preserved fruit. I also added a bit of flax seed to the crust for added nutrients and you would never know. What results is an incredibly tasty treat that you can enjoy as an after dinner dessert, afternoon snack or the perfect portable treat for a summer picnic, road trip or gathering. Nobody will know it’s gluten-free, you’ll feel satisfied and you’ll be happy you reached for these instead of a gummy bear! 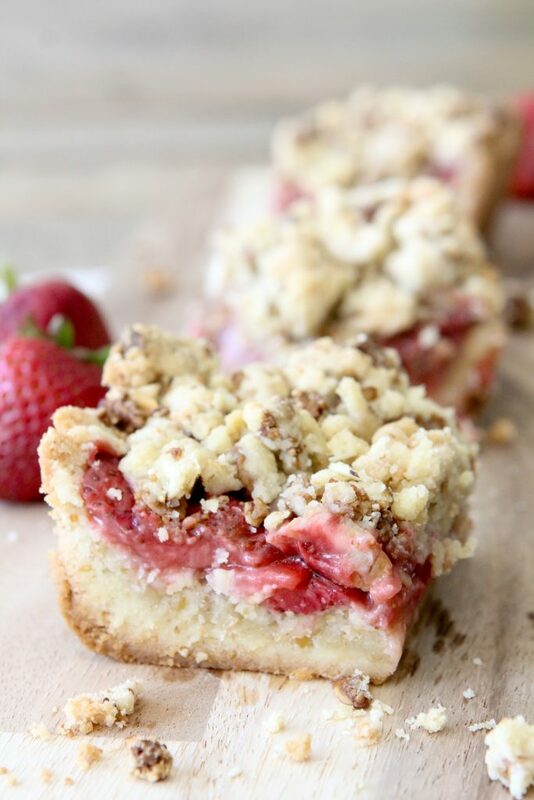 My favorite part of these Grain-Free Strawberry Crumble Bars are how the fresh California Strawberries pop against the sweet, crusty crumbles. 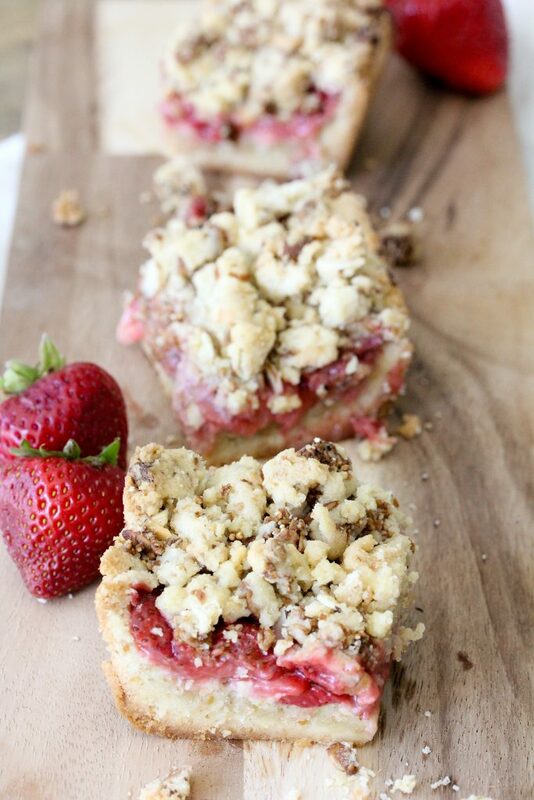 It’s the perfect combination of tart and sweet, it’s delicious. Needless to say, this one is a crowd pleaser for kids and grow-ups alike. Next time you’re looking for the perfect summer snack that feels a little more special, you’ll want to make sure to have these on hand. Make sure to Pin this to Pinterest, bookmark this page, share on your Facebook… whatever you need to do to remember them. 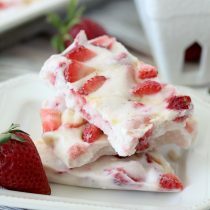 Or better yet, grab some California Strawberries and make them today! 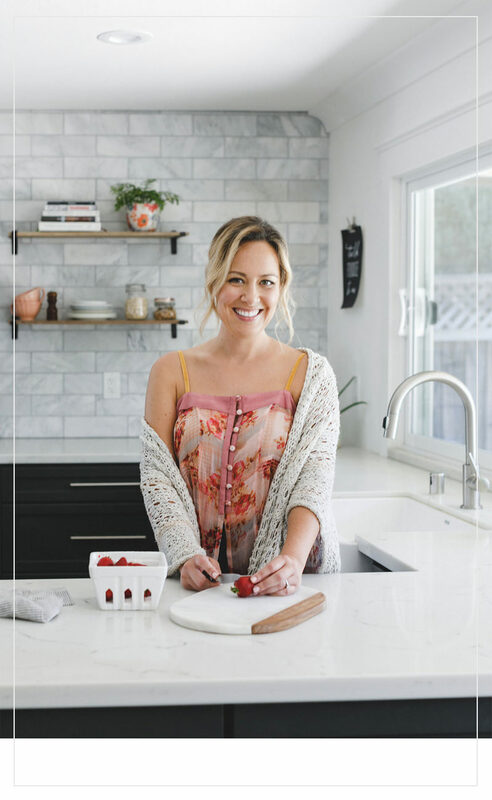 Head over to the California Strawberries #getsnacking page to find some major strawberry snacking inspo. 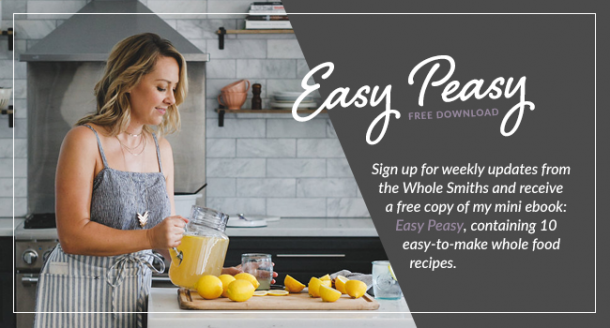 Don’t forget to enter their monthly contest for an Amazon gift card! 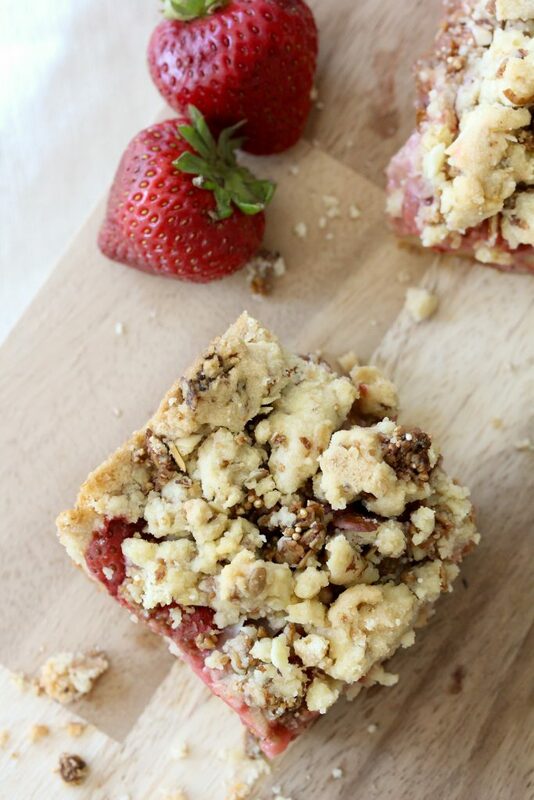 Gluten-Free Strawberry Crumble Bars from The Whole Smiths. 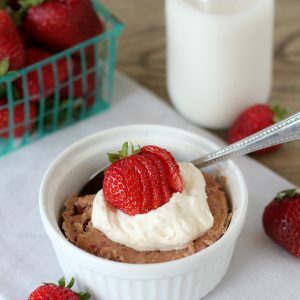 Easy to make, simple ingredients and delicious! In a stand mixer or using a hand mixer, add the butter and 2/3 cups of sugar to a bowl and mix until it is incorporated. Slowly add the flour while continuously mixing until the flour is full incorporated into the butter and sugar and forms a dough. Add the flax seed, vanilla and pinch of salt and mix until combined. Lightly grease an 8x8 inch baking pan. Separate 2/3 of the dough and gently press onto the bottom of the pan and slightly up the sides of the pan. 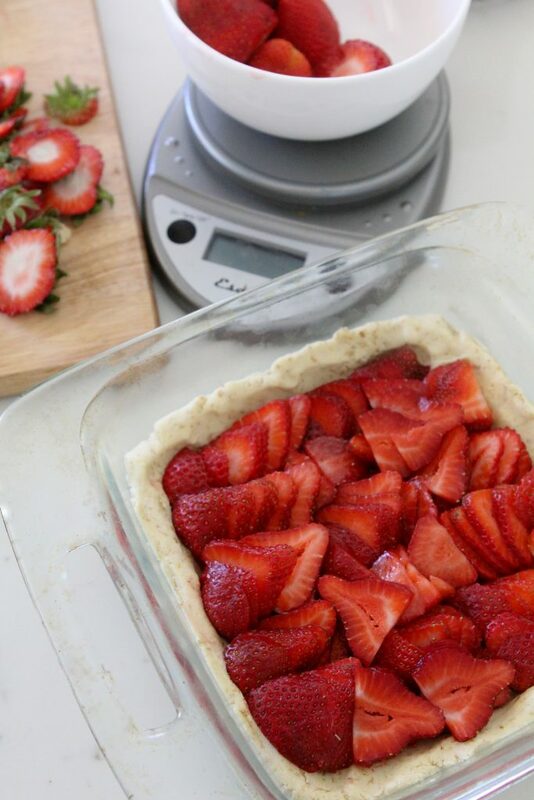 Layer the strawberries evenly onto the crust. Sprinkle the remaining 1/2 tablespoon of sugar over top of the strawberries. 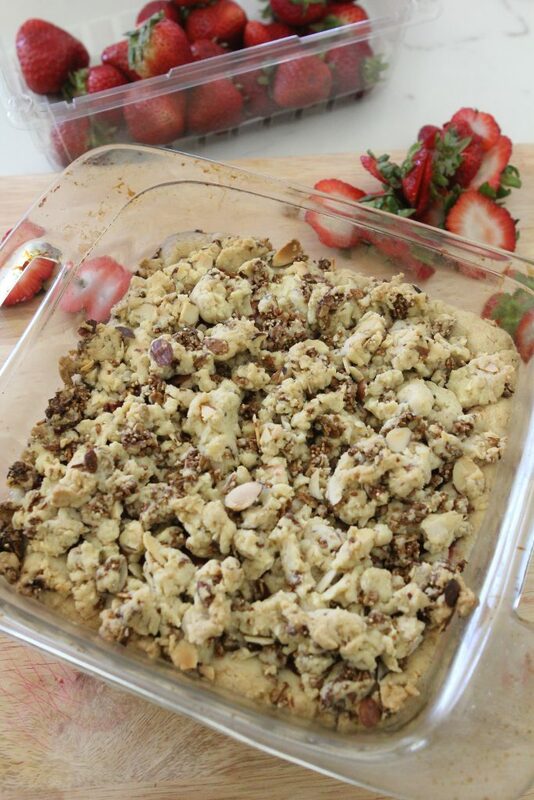 Combine the remaining dough, granola, almonds and cinnamon in a bowl and crumble it over top of the strawberries. Place the baking pan in the over and bake the bars for 40-45 minutes until the top is golden brown. 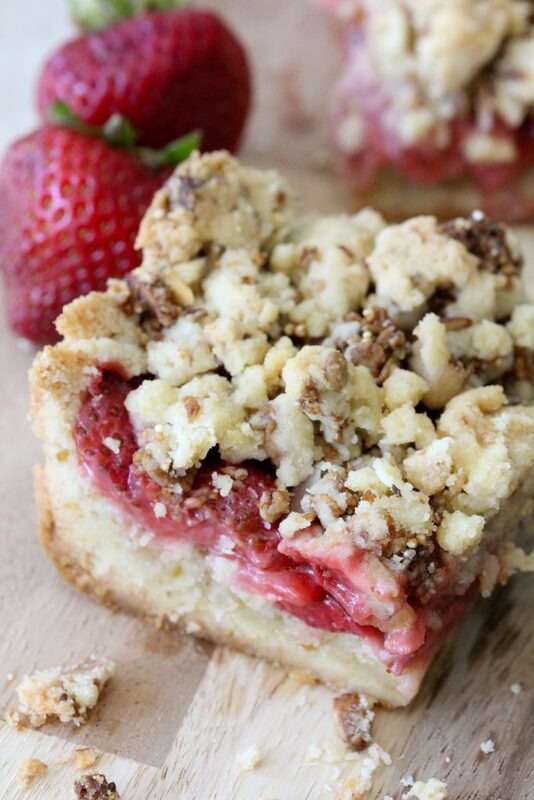 Remove the pan from the oven and let the Gluten-Free Strawberry Crumble Bars cool for 45 minutes prior to cutting. With a sharp knife, cut into nine pieces and serve.